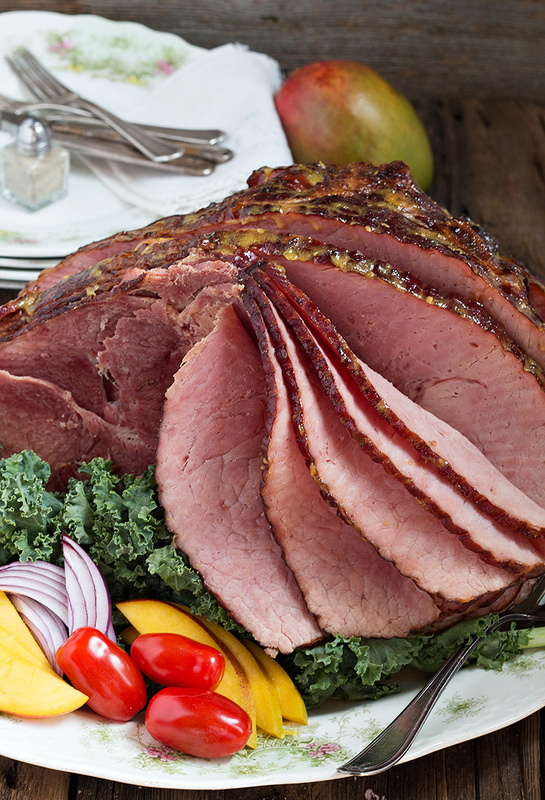 This Mango Mustard Glazed Spiral Ham would be a wonderful addition to your Easter table! With a quick, easy and delicious mango and mustard glaze, it’s a perfect way to brighten up your Easter meal. Disclosure: This post is sponsored by the National Mango Board. As always, all opinions are my own. Thanks for supporting brands that support Seasons and Suppers. Ham and fruit is a classic combination. 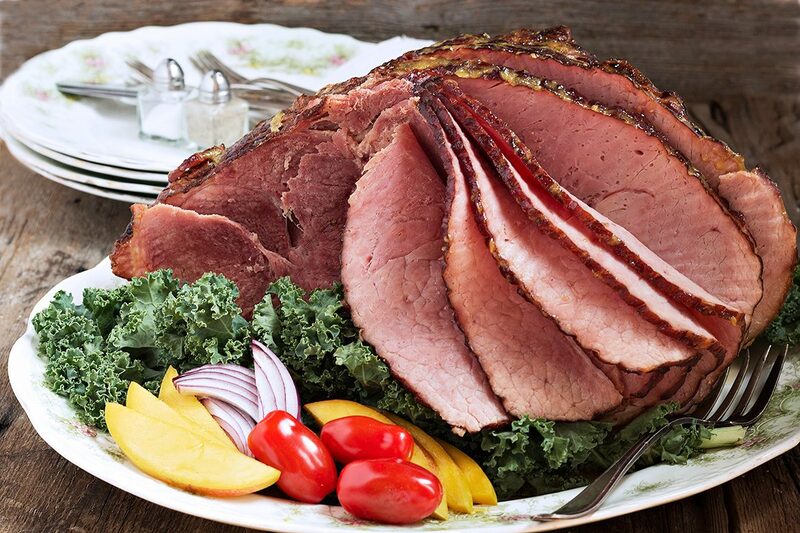 The fresh, sweet fruit flavours pair beautifully with the salty and smokey ham. So it should be no surprise that mangos also go perfectly with ham. 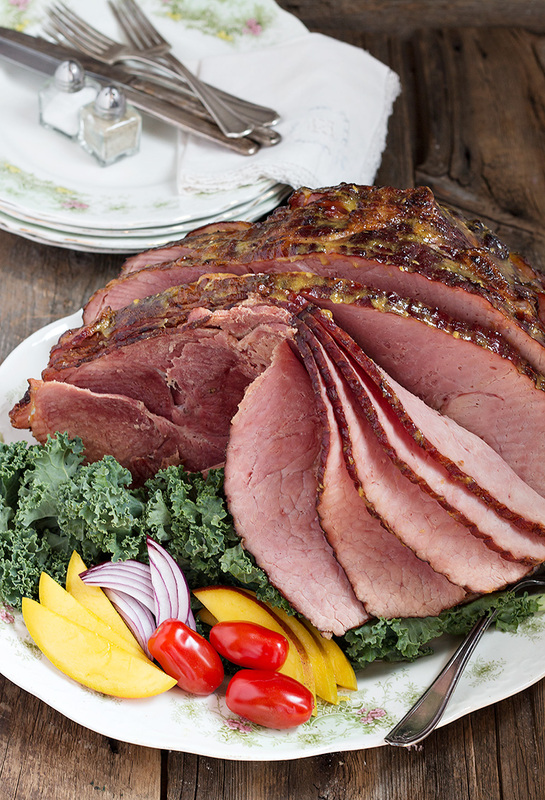 This quick and easy Mango and Mustard Glaze is just the thing to brighten up your Easter ham! Mangos are one of the most popular fruits in the world and are a staple in the diets of many cultures. Mangos are available year round, so you can always get your hands on a perfect mango. While this tropical fruit tends to remind us of Summer, using it throughout the year can introduce a little sweet, fruity taste any time. Selecting a Mango: Don’t judge a mango by it’s colour! Red does not mean ripe. To find a ripe mango, just squeeze gently. A ripe mango will be slightly soft, like a peach or avocado. That said, if you have a firm mango, it will ripen at room temperature over a few days. 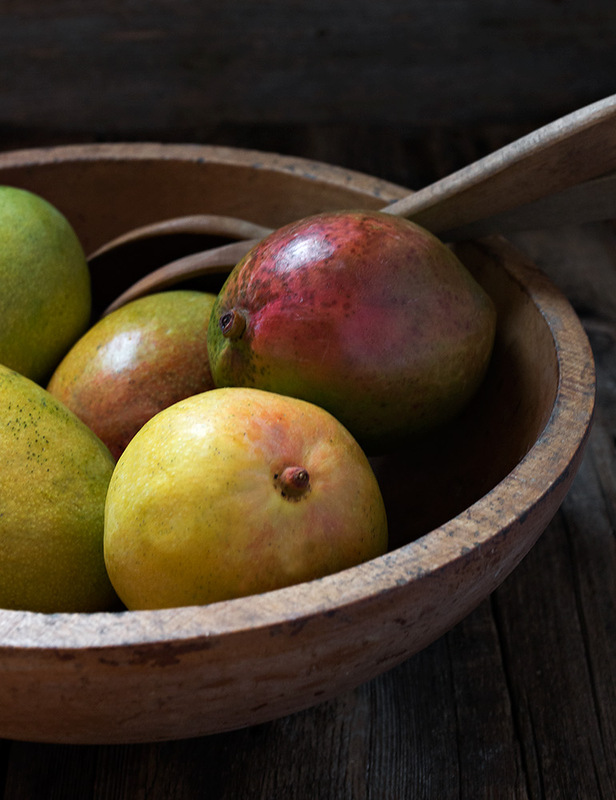 Storing your Mangos: Keep unripe mangos at room temperature. Never refrigerate mangos before they are ripe. Once ripe however, they can be moved to the refrigerator to slow down the ripening process for a few days. You will have left-over mango glaze most probably, but don’t throw it out! It would make a great salad dressing. Simply whisk it up with some olive or vegetable oil and drizzle over a salad, for a delicious, fruity salad dressing. Speaking of salad, if you want to really run with the flavours of this ham, make a salad to go with it. 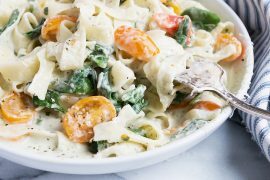 Simply toss together some lovely fresh, curly kale, with cherry tomato halves, sliced red onion and of course, some fresh mango slices or cubes. 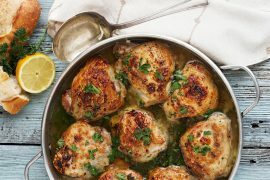 Drizzle with salad dressing whipped up from your left-over glaze. Top your spiral ham with this quick, easy and delicious mango and mustard glaze, to brighten up your meal! Allow ham to sit at room temperature for 30 minutes prior to cooking. Preheat oven to 325°F. Place ham cut-side down in a roasting pan and bake for 1 hour and 10 minutes. While the ham is cooking, make the glaze by combining mango, vinegar, honey, mustard, garlic and pepper in a blender. Puree until smooth. Brush the glaze over the entire ham, return to the oven, and continue to cook for another 20 minutes, until the glaze is set and the internal temperature of the ham reaches 140°F. Serve. I’ve got a ham just waiting to be glazed and mangoes in the fridge. I think I know just what to serve for Easter! Thanks mango mustard glaze sounds amazing Jennifer! My son Sean loves mangos. I’m going to send him this recipe. I guarantee he’s going to slather it on anything and everything! 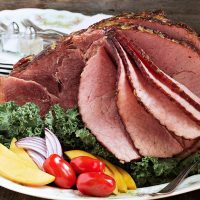 This is such a fabulous idea for ham, I never would have thought of it, and I just happen to have ripe mangoes leftover from my poke bowls! Thanks Sue! 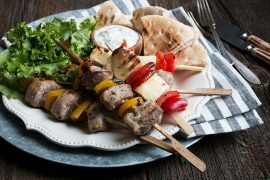 We really enjoyed this glaze so it would be a great use for those leftover mangoes!